Music Industry Men Join Cry To Change The Recording Academy : The Record Nearly forty powerful men in the business have signed a letter calling for the Grammy organization to "transform its member base." 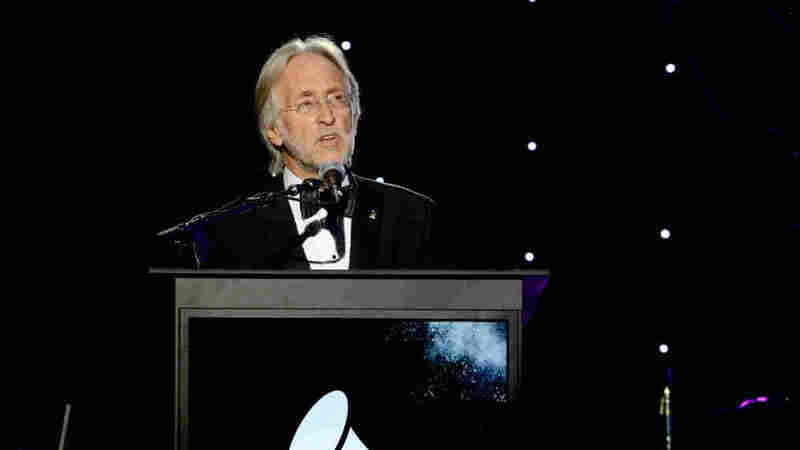 Recording Academy president and CEO Neil Portnow onstage at a pre-Grammy Awards event in New York City on Jan. 27. Another group of high-profile players in the music business are calling on the Recording Academy (also known as NARAS, the National Academy of Recording Arts and Sciences) and its president and CEO, Neil Portnow, to make fundamental changes to address gender disparity within its ranks and at the Grammy Awards. The letter follows one issued earlier this week from some of the industry's most powerful female executives. This time, it's a group of male executives. The letter, which was published in full by Variety on Thursday afternoon, stops short of asking Portnow to step down from his role as the president and CEO of the Recording Academy, which he has led since 2002. "Structural flaws in the makeup of The Recording Academy itself have led to systemic issues in the selection of nominees and winners for the [Grammy] awards," it reads in part. "Now is the time for NARAS to lead and be transparent and dedicated to transforming its member base to truly mirror the rich gender and cultural diversity of our community. NARAS should reveal the diversity (and/or the lack thereof) of its voting members and make necessary changes to the population of the Academy to better reflect the diverse music business voices the organization is meant to serve." The letter was spearheaded by Tom Windish of the Paradigm Talent Agency (whose roster includes such acts as Lorde, Skrillex and Sturgill Simpson), and was signed by 38 male executives, including high-profile industry presences such as Scooter Braun, who manages Justin Bieber, Kanye West, Ariana Grande and David Guetta. The other co-signers are primarily artist agents, attorneys and managers.